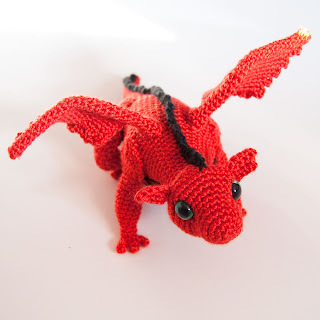 The Itsy Bitsy Spider Crochet: A new baby dragon! I just wrapped up a special order that should be heading to the UK and was so pleased with the final result that I HAD to share. Here is my latest baby dragon! 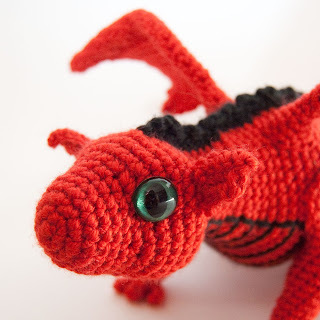 The requester asked for a red dragon with black spines and grass-green eyes. Of course, Clara at 6060.etsy.com came through for me with the most beautiful hand painted eyes. Aren't they just amazing? This guy was a little change from my previous dragons. Instead of using Red Heart acrylic yarns, I used a soft yarn (like Caron Simply Soft). It gave the body a beautiful shine and looks more like real scales than the Red Heart. I think this may end up being a permanent change for me! So welcome to the world, little baby dragon. May all your flights be happy ones. 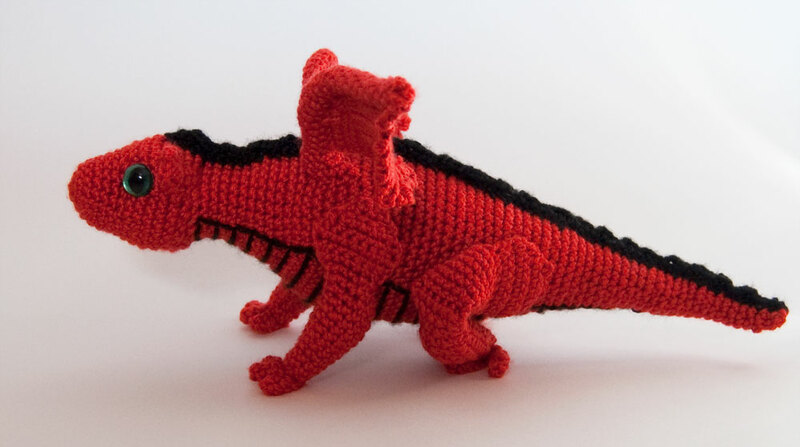 And for those of you out there looking for a fun winter amigurumi project, the dragon pattern is available in my Ravelry pattern shop for only $4! It's so great!! You're so talented lady! Awwww, Becky. You're making me blush! Have you been working on any of those wonderful afghans you make lately? He is great. The details are wonderful! That is a lovely little dragon... truly beautiful... don't you find it difficult to part with some of your creations? Especially ones as cute as these? very nice,, now he needs a castle to fly over. Thanks Velma and Ames & Tash for the kind words. You guys keep inspiring me to try new things -- we'll see what comes up next! 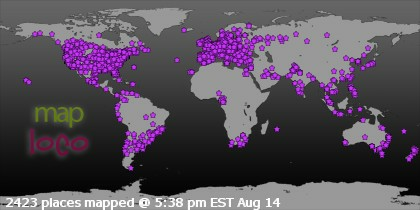 @Cheesy -- I totally have separation anxiety from my creations! I hate sending them off to their new homes. But once in a while I will get a note from the new owner telling me how much they love their new spiderling and it makes everything worthwhile!